So we left Pila that afternoon, came down the gondola to Aosta, drove to our house in Charvensod and packed the car. Off we left when the sun was setting down and said goodbye to Aosta, ready for our next adventure on our family half term trip– Courmayeur Mont Blanc. We were not going to be long in Courmayeur, only a couple of nights. I have been there previously with the family every year having breakfast the last Saturday of the week, and recently visiting in November for a couple of nights during a working trip. But I wanted to be feeling what is to be there, staying overnight and sharing it with my family. We arrived in Courmayeur and we had a reservation in the Edelweiss hotel, a 2* hotel right in the middle of town. As this was carnival week, it was extremely difficult to find a place where to sleep, more for only two nights, when the hotel owners could sell the full week. But thanks to some contacts within Courmayeur, I’ve got this hotel, which is very simple, but really nice. I would say it is more a 3*. Maybe the breakfast is simple and that gets it down to a 2*, plus the restaurant does not open for lunch and dinner (it opens for all meals only in the summer), and that might affect the star count. Anyways, we were trying to access it through the road that goes around the centre and realised that it was starting to be difficult, so we’ve called the front desk, that told us to get into Via Roma (that is only for pedestrians at that point), and then turn right after the Bank. We did so and could park just next to the door, so that was a bonus. Basically people staying in hotels that the access is through the pedestrianized Via Roma, can drive through it, and then the hotel calls with your number plate so that you are not fined. We were given an apartment- the apartment with no number or name, which was very funny. It was great, two rooms, living room and bathroom very ample apartment with a balcony seeing into the snowy roofs in town. We’ve changed and went out for dinner. Thankfully it was late and we could find a place, as it is impossible to go out for dinner in Courmayeur in a week like Carnival, and find a place if you have not made a reservation. We’ve finished in the Restaurant Ancien Casino that was just around the corner on Via Roma. It seemed a small place with only a couple of tables, but it had a bigger first floor. The restaurant was lovely and lively, and the food excellent! I had some gnocchi with prawns and courgette that were superb, and my husband had some black ink pasta that was excellent too. The boys were very happy with their pizzas – nothing to beat Italian food with kids… they always love it! Enrique ready waiting for the funicular. Photo by The-Ski-Guru. We went to sleep and the next morning we had breakfast at the hotel and then got ready to go skiing. As we were all carrying our skis, we went in our shoes, but carrying our boots and skis along Via Roma. It was a bit of a stroll, but we eventually made it to the base of the Armani funicular. I was having my friend Catherine with her family staying there all week, so we’ve arranged to meet them after dropping the boys at ski school. We went up the funicular, which arrives into Plan Checrouit, where pretty much the base area of the mountain is. There are lots of restaurants, the two ski schools and rental shops. We’ve used one of the rentals to drop our snow boots, and we’ve changed into our ski boots. From there I’ve found Catherine, and her girls were already at their group lessons. We had a private lesson for the boys with Joel, from the Courmayeur Ski and Snowboard School. Joel was a pretty cool instructor for the boys that took them all over the mountain and skiing through the forest, where they went to see some gnomes of some sort… I did not go there, this is what they’ve told me. We got up the Chécrouit cablecar, which is a petite version of the one in Aosta, which takes six people cosily, to say it in a certain way. We made it up, we did not take the Youla cablecar – which is lovely, it looks like an old cablecar – because there were very long queues to access it. As we were only having two hours to use on our own, we preferred to ski as much as possible. The snow that day was a bit weird, it had been raining up in the mountain so the consistency was awkward, but still, there were lots of it. This Friday was particularly busy, as Catherine told me, but the runs down to Plan Chécrouit are so wide, that you can come down anywhere. It was hard to keep up with Catherine and Scott, they have been skiing all their lives and were going pretty fast. I realised I was extremely tired from the powder day in Aosta, and that I am not so fit anymore! Lawrence getting into the forest before going for lunch to Maison Vielle- Photo by The-Ski-Guru. We did a couple more runs, and then we’ve picked up the boys. Catherine and Scott stayed with the girls a bit in the base area, while we’ve taken the boys up the mountains. The two wanted to come down a black run, but I was so out of shape, that I was not sure if I was up to it… plus this was a ski area I never skied, and I do not want to take them to a run I don’t know. So we’ve went up again the Chécrouit cablecar and just took a quick drink on a small bar/restaurant on top of the mountain, and then looking at the map, we came down a red – we were trying to find the Maison Vieille restaurant, where we were going to meet with Catherine, Scott and the girls again. It took a while coming down, as it was a bit bumpy and our youngest kept on falling down. Thankfully my husband went to his rescue and brought him down. Halfway through I’ve thought we took the wrong turn, but fortunately, the map was not so clear, and the restaurant was to our left, a bit higher up, but we climbed up and we could have a nice relaxed lunch. Maison Vielle with the Mont Blanc in the backdrop – the place to eat in the mountain- Photo credit: The-Ski-Guru. The day started being a bit cloudy, but the sun was starting to come out. At the Maison Veille you have lovely views of Mont Blanc and because it was pretty warm in the sun, we’ve had lunch al fresco. The kids were playing in the snow, building a snowman. As this place is a bit out of the way of everyone, it is really safe for them wondering around. After their lunch, they went to make some laps in a beginner’s poma lift that was next to the restaurant, while we finished our lunch. Then it was time to move, and we decided to go easy, as the youngest girl of Catherine has just started skiing – but she was doing actually very well for beginner. We came down a blue run and when we were down, Catherine stayed with her youngest kid in Super-G, while we went to do some extra laps on the mountain. Getting ready for one of our afternoon laps with the Dent de Geant in the backdrop – Photo by The-Ski-Guru. People started getting back around 4, and we’ve stayed until 5, so the last runs were pretty empty and we really enjoyed the mountain. Finally we went to pick our snow boots, got changed, and went back to the cable car. The most amazing views with the sun setting down could be seen from up there. As the funicular stays opened until midnight, we were not in a hurry to come down. The kids having lunch at Maison Vieille in Col Chécrouit. – Photo by The-Ski-Guru. Usually you would leave your skis and boots on top of the mountain, so you do not need to carry them back and forth. There are lockers also on the bottom of the mountain. But we were leaving, unfortunately, the next morning, so we have to carry all with us. Catherine and Scott were very nice to carry some of our stuff. I was having a backpack with a couple of pairs of boots, the helmet, my skis and one of the kids skis, so my back was killing me! The kids hanging out at Cafe des Guides pub- Photo by The-Ski-Guru. Our hotel receptionist was very nice to get us a table for 9.30 PM – in Maison Frety. We’ve tried to find something else, but that was impossible, everything was really booked. We all had baths, I went very quickly to see my friends of the Courmayeur’s Tourism Office and then came home, had a bath, while my husband and boys were going to meet Catherine, Scott and the girls at the Café des Guides, a small pub under the Museum of Alpine Guides, in the main square of town, across the church. I went afterwards and met them there, and had some very nice Aperol Spritz. The owner of the café and the waiter were from Argentina, like myself. They were very nice, not very good for taking a tab of how many beers my table were ingesting, but that is part of its charme, I guess. Lawrence in Via Roma going to Mont Frety restaurant. Photo by The-Ski-Guru. The kids were very good drawing; they made a drawing competition, of a ski map, a snowman, a skier and boarder. Lots of creativity in the group! Then we started walking all along Via Roma to the other side of town to have dinner in Maison Frety. We had a lovely dinner there until pretty late at night. 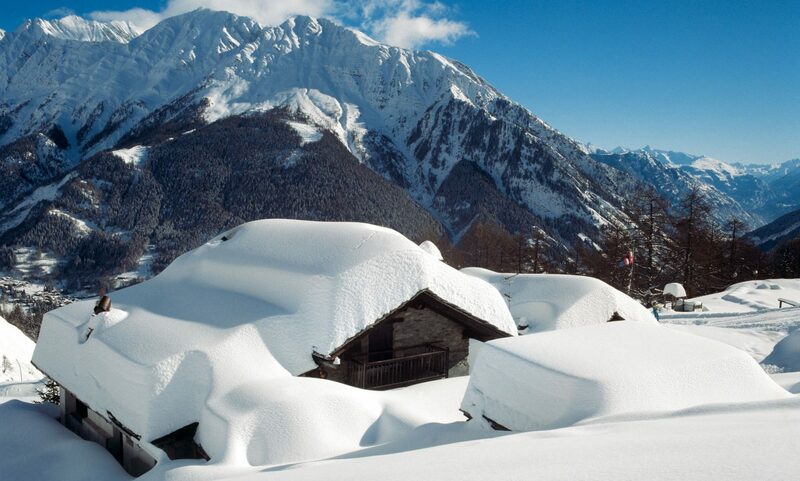 Snow before leaving Courmayeur – Photo by The-Ski-Guru. One thing to do if you have time and the weather is nice, prior leaving Courmayeur, is taking a helicopter sight-seeing trip around the Mont Blanc. There is a heli-operation GMH that also caters non-skiers for sight-seeing trips. Coming out the other side of the tunnel to France, it was raining a lot, and it was like that pretty much all of the way. That last night we slept in Reims, had dinner with Jo and Paul and their boys, compared notes of how was their last day skiing in Pila, with ours in Courma, and then went to bed. Travelling through France- Near the Aire du Poulet de Bresson – near Bourg-en-Bresse. Photo by The-Ski-Guru. The next day was the last leg to come back to Britain, the weather was nice, and the road was empty. What is more, as soon as we got to Eurotunnel, they’ve made us go in an earlier train, and we did not have to even stop at the terminal, so we were finally around 3.30 PM back at home. Back on the Eurotunnel – going back home. Photo by The-Ski-Guru. You can read how was the trip coming up to Aosta, as well as how was our skiing days in Pila, and also this article on how to pack for your family ski trip, and on tips if you are driving to the mountains. During the beginning of the ski season, there were lots of tourists stranded in the Alps. If planning your family ski trip, you can see the rates of the ski passes in Europe. Don’t forget to check our MUST-Read Guide to Courmayeur. And coming now, the Mountain Gourmet Experience 2018 in Courmayeur. Previous PostPrevious Vail Resorts Introduces Emma, Your Epic Mountain Assistant. Next PostNext Tragedy strikes again in the Verbier region of Switzerland, one skier is dead and three are missing after an avalanche.